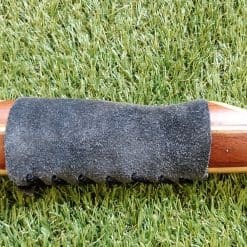 The new “Edge” flatbow grip is made primarily of olive brown Dymondwood and white oak, lending it a bit of extra weight in the hand. The grip is medium in size, sculpted primarily for a low wrist position. The shelf is cut moderately with a shorter sight window, lending the bow more toward instinctive shooting. 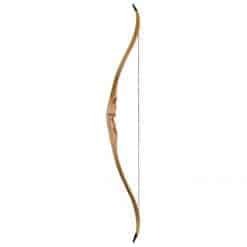 The Edge draws well thanks to its only ~17″ riser core, and while designed for a 28″ draw, the long triple lamination maple limbs allow the bow to be pulled beyond that specification. Hand shock is reduced thanks to a mild deflex and reflex built into the limbs, improving the overall shooting experience. 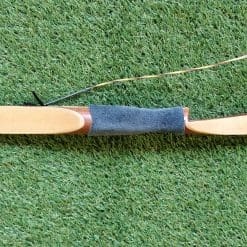 Like its recurve counterpart, the Edge longbow brings us a dependable successor to the retired Red Stag longbow while improving both the handle and limb design for an overall superior piece of equipment. The bow includes a shelf setup as well as a standard B50-type string and string setup. It is also capable of accepting a Fast Flight type string for improved arrow speed.